President Paul Kagame and King Mohammed VI of Morocco in Kigali, October 2016. Rwanda and Morocco entertain cordial relations. President Paul Kagame has had a phone conversation with King Mohammed VI of Marocco who promised continued support to the African Union (AU) reforms, media in Morocco has reported. Kagame who is also the current chairperson of the African Union had the conversation with the King on Monday, November 5. The president was in July 2016 tasked by the African heads of state and government to make AU reforms and make the union an autonomous organization which rely little or not at all on foreign aid. In January 2017, Kagame and a team of experts he had formed presented their proposal to the General Assembly. It was agreed that every country will contribute a 0.2% levy on its imports to support African union’s activities/operations. Some countries have already executed these reforms. The eleventh Extraordinary Session of the Assembly of the African Union is scheduled to take place on November 17 in Addis Ababa – Ethiopia and is expected to take further decisions about AU reforms. “The King pledged his support to President Kagame in this reform exercise,” part of the story reads. 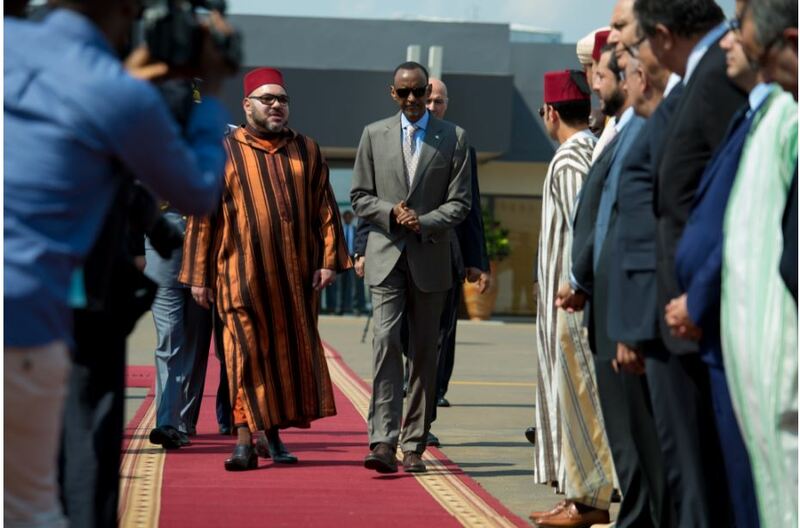 While in a state visit in Rwanda, King Mohammed VI of Morocco together with President Kagame witnessed the signing of 21 hot deals of projects. A total of 21 agreements is roughly grouped into eight categories including; business, agriculture, politics, infrastructure, education, health, social welfare and security. The King himself invested $41 million in acquisition of 76.19% shares in Cogebanque-a commercial bank that was owned by Rwandan shareholders. A Moroccan real estate company also pitched a project to construct 5000 affordable housing units in Kigali city. Palmerie Development Group Company sealed the deal worth $ 68 million. In Partnership with Development Bank of Rwanda (BRD), the ground-breaking for construction of the appartments will take place early December.